We have a really fun giveaway for you here, and it is part of a bigger giveaway hop. 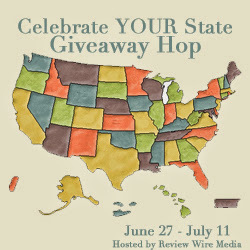 First, some info on the whole giveaway hop. Each of the bloggers involved found a sponsor based in their home state. So, for me, I found a sponsor from Massachusetts. That sponsor is Winning Moves Games. We recently had one giveaway with them, and they were gracious enough to both offer me even more games for review and a great $120+ prize package. Winning Moves Games has some great classic games for sale. 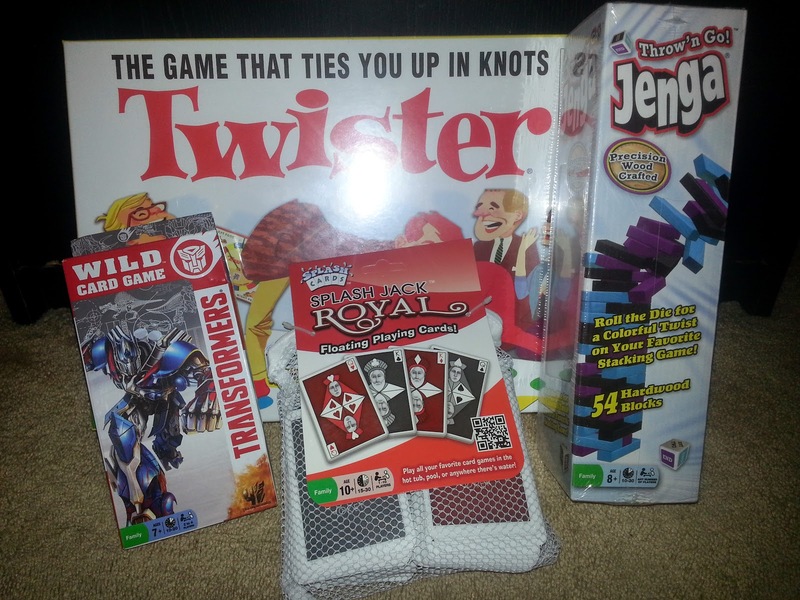 They sent me Twister, Jenga Throw 'N Go, and the Transformers Wild Card Game. The giveaway includes those three games and four sets of their Splash Cards: Splash Jack Royal, Splash Jack, Splash Pals, and Splashimals. The Transformers Wild Card Game is related to the recent movie. For ages 7 and up, there are two games you can play, a beginner and advanced version. Not familiar with the movie, it wasn't something my son was fond of. With school out for the summer, we've turned the Twister game into a giant Math activity sheet. Do a math problem and put your right foot on the tens and left foot on the ones, or something like that. Throw 'N Go Jenga is an update to the classic game that adds a six-sided die to help you pick where to pull next. My son is more into building forts with the pieces, then knocking them over Angry Birds-style. If you missed the Splash Cards description in the last giveaway, they are cards that can get wet and float. There are four different versions for different ages. For the right age, they're fun in the bath. For the older crowd, you can even play poker in the hot tub with one of the sets. You can win all of them if you enter to win below and are selected the winner. 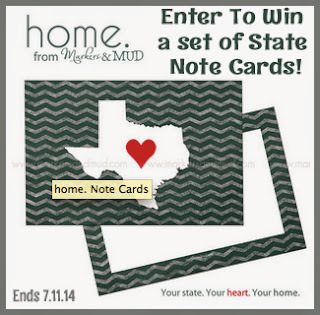 Make sure to stop by The Review Wire for The Grand Prize, enter for your chance to win a set of Home State Note Cards and a personalized set of color note cards! A special thanks to Markers & Mud for sponsoring the Grand Prize! Enter to win the seven games/cards mentioned above from Winning Moves. ARV $120.65. Open to US residents who are 18+. Giveaway ends 11:59 pm EDT on 7/11/14. Disclaimer: This giveaway ends at 11:59 PM EST on July 11, 2014. The celebrateYOURstate Event Bloggers are not responsible for sponsors that do not fulfill their prizes. Companies and bloggers, if you would like to participate in group giveaway events like this one, sign up to be emailed about future events hosted by Review Wire Media. I miss playing the game of Sorry. Not too long until my daughter and I can play! I use to enjoy playing Payday and Yahtzee with my family. We always played Trouble when we were growing up. We palyed it so much it was a little beat up, but still worked great! I miss playing the game trouble. I use to love popping that dice in the middle. My sister and I would play this game all of the time. I miss playing Yahtzee with my grandmother. I miss playing trouble. I loved the pop-o-matic. we still love playing yahtzee! its a family favorite! I would have loved to play Pass The Pigs Pig Party game. twister, we used to play it in the backyard for hours! I miss Aggravation. On rainy days, we would play all day. Twister was always lots of fun. No way I could move enough to play it now! Trouble was always a favorite around here. I gave klout today on Java. My favorite game is Sorry. I miss playing bunco with my cousins. That's a really hard one. I'd say it's a tie between Sorry and Aggravation. I miss clue, usaed to love that one. I miss playing Yahtzee. I used to play that game all the time! Classic Yahtzee is a great game. I used to play that all the time with my friends when we were growing up. My one daughter still loves to play with me, but we don't get a chance to play that often. I'd have to go with Parcheesi - my sister and I played that non-stop as kids! I miss playing the ORIGINAL game of Life! I loved playing the Game of Life. Yahtzee was something I loved. Trouble was a game I loved playing. We loved to play Risk! Took awhile but worth the fun. Sorry was always my favorite. I miss Monopoly the most. I loved Trouble as a kid. They year I got it for Christmas I spent the weeks before pressing into the middle of my wrapped present and listening to the little dice bubble "popping". I miss playing original trouble. My son has the newer versions but they just don't hold up as well. I miss playing trouble with my family when I was little, I used to have so much fun playing! I miss playing Trouble with my cousins. I miss playing The Game of LIFE. Boggle has been one of my favorites for almost as long as I can remember. My mom and I still play every time we get together. Clue! And Life! I loved those when I was little! We'd play in the garage so we could also have the radio on without bugging my parents. I miss playing Trouble! It was such a fun game and I always loved popping the bubble with the dice in it versus rolling dice. I miss playing Classic Twister® from when I was a child. I miss playing the game Trouble. I miss Clue, Sorry, and Parcheesi. Growing up, I loved playing Trouble. I miss playing Sorry and Clue from my childhood. None of them because I bought them all again and play all the time! =) I love The Game of Life and Sorry and Jenga and Twister! We had a HUGE strategic battle with numerous people playing the game "Risk". It was like a weekly thing! My favorite is clue.... i always loved playing iy as a kid. I miss playing Yahtzee with my cousins. I loved Monopoly when I was a kid. I used to love playing trouble! I like the pop of the the dice. Trouble and connect four. Loved game night when I was a kid. i used to play scrabble all the time and i loved it. I liked the game trouble as a kid. I would play it every day with my brothers and friends. I miss playing Classic Trouble. I miss playing Aggravation it was really fun !!! It would definitely be Jenga, I guess i'm one of those few people that actually loves this game lol. Still to this day, though we can never manage to keep all the pieces for more then a few months lol.